Is the Chinese regime’s relationship with the US ruling family a factor behind these arrests? On 5 June the US State Department called for the release of the three men. No statement has been issued by Trump or her father however. The Chinese authorities immediately rejected the US call, stating on 6 June that foreign countries have no right to “interfere” in China’s judicial sovereignty and independence. This is a standard response from the Chinese dictatorship using nationalism to avoid deeper scrutiny of its increasingly repressive rule. The past few years, especially since Xi Jinping came to power, have seen a deepening crackdown on labour activists, lawyers, feminists, NGOs and social media. A raft of new laws under the banner of “state security” is being used to criminalise peaceful protests and actions to expose human rights abuses, environmental crimes and violations of workers’ legal rights. Forced disappearances, televised ‘confessions’, taking family members or colleagues hostage, and torture, are all features of this crackdown. NGOs with “foreign ties” – as in this case – are particularly being singled out for attack with Xi’s regime convinced it could at some point face a “colour revolution”. This is the term it uses to describe the Arab Spring of 2011 and other mass revolts, alleging that foreign-funded groups are plotting its overthrow. In reality, foreign and domestic NGOs do not question China’s dictatorial system. Their activities are linked to achieving relatively modest, sectional improvements. The three men – Li Zhao, Su Heng and Hua Haifeng – were engaged by the US-based NGO China Labor Watch (CLW) to investigate reports of extreme working hours, low pay and exploitation of student labour by Huajian. A letter to Ivanka Trump from CLW said workers at the two factories regularly work more than 15 hours a day, with just two days off a month, and suffer verbal abuse from managers. 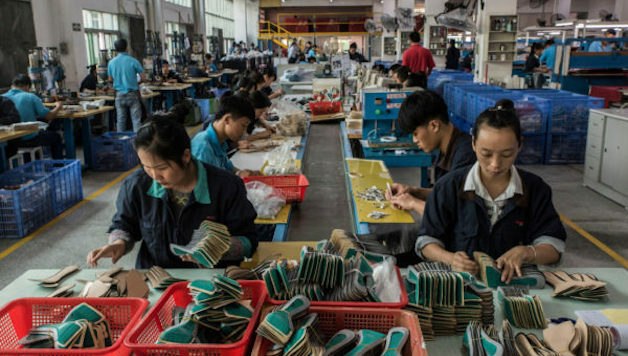 Huajian Group produces around one-third of Ivanka Trump branded shoes – more than 100,000 pairs per year. CLW has previously published exposés of Chinese production facilities used by Samsung, Apple and Disney, involving illegal practises such as the use of child labour. The NGO sounded the alarm after it lost contact with its three investigators in late May, describing their detention on criminal charges as “unprecedented”. Their plight looks increasingly grim as the Chinese authorities – utilising a completely rigged regime-controlled judicial system – announced a string of potentially serious charges. Based on state media reports, the three activists face charges of using “illegal surveillance equipment” and “sending industrial secrets abroad”. A CLW spokesperson denied the charges, while at least one legal expert has questioned whether the charge of using “illegal surveillance equipment” even exists in China. Probably, the state’s case against the activists rests on their possession of smart phone/cameras – devices that 695 million Chinese own. Foreign office spokeswoman Hua Chunying told US media the men were being held on “suspicion of interfering with the company’s normal operations and production activities” – wording that suggests any form of strike, go slow, or collective stoppage by workers would likewise constitute a criminal offence. Li, Su and Hua are reportedly being held in Ganzhou in Jiangxi province, where one of the factories under investigation is located. Hua’s wife said he is being held in a cell with 20 other prisoners who have been ordered not to speak to him. He has to sleep next to the toilet bucket. In previous years dozens of such undercover investigations have been conducted at Chinese factories, helping to expose appalling conditions. These were largely tolerated by the Chinese regime in the past, which saw such investigations as a way to shame factory owners into dealing with some of the worst forms of abuse and thereby defuse potentially destabilising worker unrest. The ‘Ivanka arrests’ point to a shift in regime priorities – with profits squeezed and the economy in trouble the authorities are more anxious to discourage workers’ demands. Accordingly, we can speak of a new chapter in the state’s crackdown against labour rights advocates. Hundreds of worker activists have been arrested in the past year for organising strikes and other protests which are illegal in China. The high profile trials and televised ‘confessions’ of three labour activists in Guangdong province last year, resulting in suspended prison sentences, was a further attempt to stem the rising tide of strikes. In stark contrast to the vociferous China-bashing of her father during his election campaign (now abruptly dropped to appease Wall Street), China is a key market and production base for Ivanka Trump’s company. Imports to the US of Ivanka branded products rose 166 percent in 2016, almost all of them made in China. The company’s gross profits rose to $840.9 million for the 2017 fiscal year. In April, Ivanka’s company won monopoly rights to sell its branded jewellery, bags and spa services in China – a significant victory given Beijing’s opaque trademark rules. This inevitably raises questions about possible political influence especially as the deal on trademark rights coincided with Xi Jinping’s first meeting with Donald Trump and a sudden dramatic thaw in their initially frosty relations. Becoming an advisor to her father as president – an official government role – Ivanka Trump has formally stepped back from day-to-day running of her company to avoid conflict-of-interests charges, but she maintains overall control through a system of trusts. Since the arrests in China the Ivanka Trump company has sought to distance itself from Huajian Group, saying Huajian last made its products three months ago. But a spokesperson for CLW revealed that its investigators had found Ivanka Trump merchandise inside the company’s factories in April and May of this year. They also found evidence of planned production, namely a production schedule indicating pending orders for Ivanka Trump shoes due in May. chinaworker.info adds our voice to those demanding the release of the three investigators. Factory investigations by NGO activists have become the latest victim of Xi Jinping’s crackdown. The sensitivity of the Chinese regime’s current relationship with the US ruling family could be an additional factor behind these arrests. The corrupt ties between Western capitalist politicians and China’s authoritarian sweatshop capitalism need to be exposed. But the brutal exploitation and suppression of Chinese workers cannot be overcome by appealing to the ‘ethics’ of the company bosses – whose only interest is profit. Only genuine and independent workers’ organisations and mass struggle supported by international working class solidarity can change these conditions. Previous article‘No Justice No Pride’ in Washington D.C.